Bhagalpuri silk or Tussar silk is a kind of dying on the silk fabric done by skilled craftsmen from Bhagalpur, a small town in Bihar. 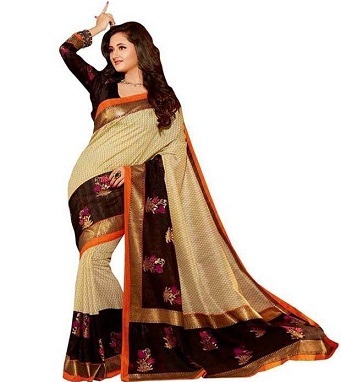 These sarees are known for their distinct and appealing prints globally. With the festive season getting closer, you can consider buying one of these for yourself. This one is a must-have in your collection of ethnic sarees. It features an eye-catching print all over. Made of Bhagalpuri silk, it adds a unique charm to your ethnic look. Impress everyone with your amazing ethnic look this festive season. The subtle yet appealing print along with the golden border will earn you a lot of complements. Add a pair of long earrings to complete the look. 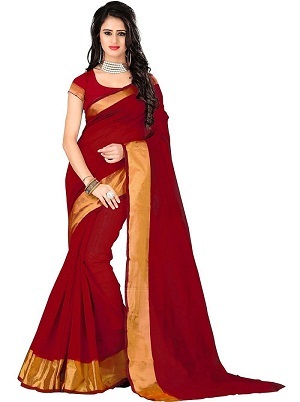 Stand out from the rest of the crowd wearing this dual tone cotton silk saree. The contrasting shades and the distinct print is what sets this saree apart from others. This beautifully printed saree will catch your attention instantly. Look vibrant as you wear this beautiful saree during the festive season. Team it up with subtle jewellery pieces to complete the look. 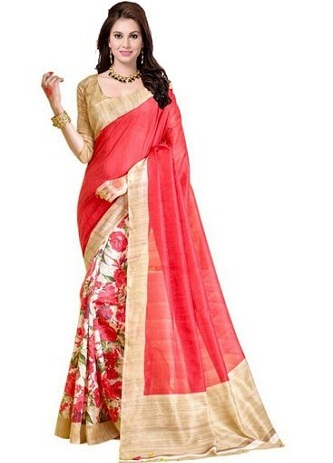 The fantabulous pattern makes this red coloured saree an elegant number to be included in your wardrobe. Wear this saree at a formal event and you are sure to steal hearts. Flaunt a new ethnic look wearing this dual tone printed saree. Featuring a beautiful mix of prints, this saree is a must-have in your wardrobe. With unique print, this saree adds a unique charm to your overall appearance. Add a subtle piece of jewellery to complete the look.